I had so much fun making and presenting this, that even if it been inedible, it would have been worth it. Luckily, it tasted quite good. I absolutely knew that I needed an occasion to serve this dish. In honour of the aspic coated days of yore we organized a retro-potluck extravaganza. People brought cheese balls, bean casseroles, cocktail weenies, deviled eggs, mac and cheese, potato salad, and old fashioned cocktails. Then I brought out a cold fish covered in salmon flavoured Jello. Most people weren’t too sure what to make of it, but it certainly caused a stir. For people who’ve been following along for a while now, it should be clear that I have an abiding affection for old-school, kind of nasty, but kind of great, dishes. For me this is the ne plus ultra of that style of cooking. It’s got the pressed linen and polished silver grandeur of days gone by, as well as a gross out, dare your friends to eat it, backwardness. 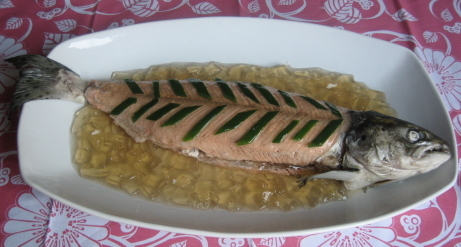 I’ve been thinking about trying a salmon in aspic for a couple of years, but after an enlightening conversation with my dining companion’s mother, in which I accused her grandmother of having been a great aspicker, I was determined. The recipe was quite involved, and time consuming. I started by poaching the salmon in water, with lemon, onion, carrot, celery, bay leaf, parsley stems, thyme, and peppercorns. Then whole poacher went into the fridge for 8 hours to let the flavours infuse. The recipe calls for a 24-inch fish poacher, which I don’t have. The biggest one I could borrow was 19 inches, so I used a smaller Atlantic salmon (4 lbs instead of 6). Once the fish is chilled, it’s removed to a cookie sheet, and the broth is strained, fortified with white wine, Madeira, thyme, and salt, then reduced. Meanwhile the most painstaking part of recipe begins, the removing of the nasty bits of salmon. Beyond a little trimming of excess bones, and floppy fatty folds, it involves peeling all the skin and dark flesh off the fish. It’s an easy instruction to read, but a delicate and painstaking job. Once the broth is reduced, it gets a further addition of leek, carrot, celery, egg whites, and crushed up egg shells, and gently simmered. You’re basically making a fish consommé in this step, using the egg whites and shells to trap little particles in the protein net they form, all the nastiness forms a raft at the top, and once you run the broth through a couple of layers of paper towel you end up with a crystal clear broth. This is one of those incredibly simple cooking techniques, that’s undeniably cool. People were going nuts about using gelatin filtration to make unusually flavored consommés a couple of months back, but making the original had its own charms. The reduced and perfectly clear broth is then added to some bloomed gelatin, and allowed to simmer for a couple of minutes ’till everything is dissolved. The mixture is then chilled in a metal bowl, sitting in a water bath ’till the gelatin just begins to set. Then it’s time to work quickly and get the aspic over the fish. I’ve read more than a few aspic disaster stories, of the gelatin just sliding off its target, or clumping up unattractively. So I was a bit worried about this step, but it worked flawlessly. I spooned on a thin layer, chilled the fish for a while, then topped it with some blanched leeks, and applied another layer of gelatin. All of the remaining aspic went into a baking dish and was allowed to set. I then cut it up and surrounded the fish with little wiggly aspic cubes. It was quite warm the night I served this dish, and we packed about 35 people into our apartment, so it got intolerably hot. Unfortunately the aspic didn’t hold up well under the heat, and mostly melted off my fish within about 15 minutes. Those who got an early serving tried it as it was meant to be, but latecomers only tried poached salmon in Jello soup. I suppose if you were doing this professionally you’d put your serving dish on a bed of crushed ice, but our ice supply was devoted to mixing old-fashioneds, martinis, and Singapore slings. I was really happy with this dish, from a showmanship perspective this was absolutely worth it. The flavour was very nice, but it couldn’t live up to my expectations for such a dramatic looking dish. It was very mild, and pleasant, which for a crowd pleasing buffet is exactly what you’re looking for. I’m impressed that the recipe is as clearly written and step-by-step easy to follow as it is. I was very afraid going in that this would turn out to be a spectacular failure, but it couldn’t have gone more smoothly. If you’ve ever considered doing something like this, I’d definitely recommend going for it. It was an excellent experience, worthy of a five mushroom rating. I think you have to give your party guests their due. Most, if not all, of the guests who were fish eaters to begin with, quite happily tried and enjoyed the aspicked salmon. As for the aspicker comment, that was one for the books. You’re right of course, many people enjoyed it, but a few were definitely baffled as to why anyone would want to do that to a fish. Thanks for that. We’re having a little potluck party next week, kind of for Xmas I guess and I’ve been trying to find something unique.. found some awesome ideas at this potluck recipes site. You know, someone should invent a website where you can write what you’ll be taking, and it would check no one brings the same thing! I am looking to build a site just like this one. Do you outsource the work done here, or do you handle that all by yourself?